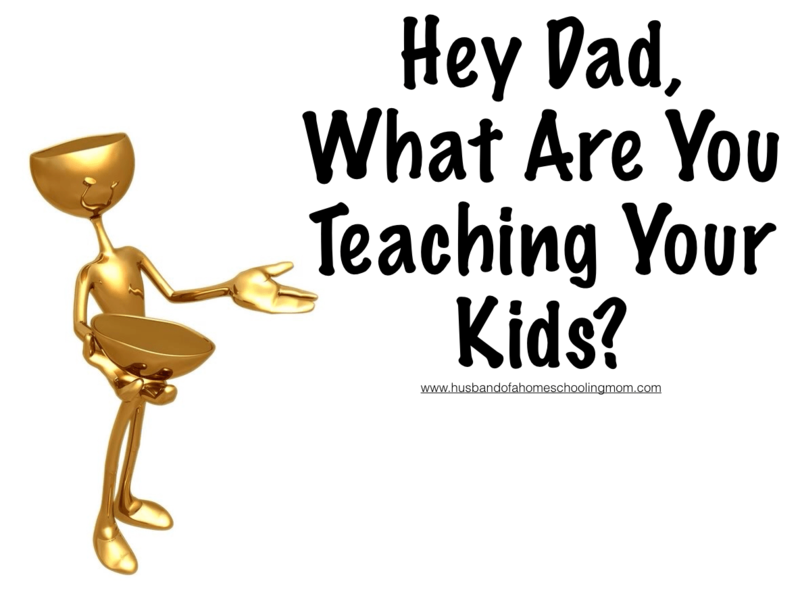 Home > Words of Wisdom > Fatherhood > What Are You Teaching Your Kids? As I have said before, there is no such thing as neutral parenting, your either going forward or going backwards. Each of us have a decision on how we handle things that come up, and how we respond shows what you are teaching. Dads, I have a rather poignant question for you today. “What are you teaching your kids?” Now your first thought may be “Whoa, Steve, I support my wife in homeschooling anyway I can. But when it comes to teaching, that is all her!” This is what I would call the typical answer from most men when it comes to homeschooling. But when you do that, what are you teaching? *BAMM* Gotcha! Now don’t get mad and quit reading, work with me here. There is more to teaching than sitting down at the table, chair, couch or wherever you homeschool and start lecturing out of a book or some curriculum. Don’t get me wrong, it takes a lot to actually teach a subject to a single child or a group of subjects to a group of kids, but there is another type of teaching, and that is the art of “doing”. Kids are like sponges. Picture a large sea sponge sitting there all dry and hard. Now start pouring water onto the edges of the sponge and watch it as it slowly starts to absorb the water. At first some will just fall off till some of the pores are opened up to allow more water to enter. After some time, the whole sponge is just sucking up all the water that it can hold. Now does the sponge absorb some dirty water? If it is presented to the sponge, it does. It does not filter out the bad things in the beginning, it just takes it all in and then processes it. Dads, you may have an eleven year old sponge like I do. He is watching me and everything that I say, I do, and how I respond to life. In essence, I am pouring into him my life actions or my “doings”. In the same way the sponge soaks up the water, he is taking in all my mistakes, triumphs, and failures. As I have said before, there is no such thing as neutral parenting, your either going forward or going backwards. Each of us have a decision on how we handle things that come up, and how we respond shows what you are teaching. This is a post that appeared today on the Teach Them Diligently blog. 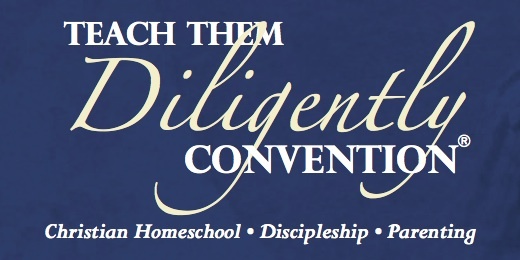 If you get a chance, head on over to Teach Them Diligently and check out other great homeschooling bloggers and even look into attending one of the three remaining conventions! My husband wanted me to pat you on the back for this one. He’s constantly teaching the children just not with the text books. He teaches them hands on concepts, building lessons, character lessons, and steps in when Mommy gets confused because our middle child has dyslexia and I’ve never had that problem. He simply kneels next to her and gets her to refocus her brain in a way that I never could. They’re all sponges when it comes to Daddy. I often hear, “you’re holding that wrong … remember Daddy said if you’re going to borrow his tools you have to use them right.” and so on and so forth. Just yesterday our middle child piped up after church with, “Those parents needed a lecture, I could hardly hear what I was supposed to hear because the parents were all talking together. I don’t know how come their kids were so good when they weren’t.” … Out of the mouth of babes, but recalled from conversations with her father. When it comes to the parents teaching, only half of it is done with text books, the other half is our actions! On the part of the kids being a sponge with daddy, this is especially true when the dad steps in as a backup teacher when the mom is the primary teacher. It gives a new perspective on the same thing that the mom is trying to teach and it makes it “new again” and the kids love it. We experience the same thing at our house when I come in and do things with the kids. This is why it is important for the dad to be an integral part of the homeschooling experience! Thanks for the comment and give your husband a high five for me on being a husband of a homeschooling mom!! Perfection In Food ~ Squeez Bacon!